Kwasi H. Agyeman is a native of Brooklyn, New York but was raised in Ghana for nearly ten years. He is a recent graduate of The George Washington University with a bachelor’s degree in History. 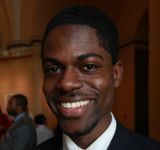 He is currently working as an assistant to the Acting Director of the David C. Driskell Center for the Study of the Visual Arts and Culture of African Americans and the African Diaspora at the University of Maryland. When he is not working as a history researcher, he loves to give black history tours of Washington D.C. He is also a proud member of Kappa Alpha Psi Fraternity, Inc.